PLEASE NOTE: I do not crusade against television; the whole world may watch it and love it. Enjoy. The oldest game between people is: "Look at this!" All my life, I've struggled with a small mind, limited attention span, limited mental and physical energy. I'm easily distracted and easily exhausted. My tank is never far from empty. I feel like a kid, let loose in Disneyland, with only twenty-five cents to spend. I often envy people who can keep many different interests going at once. They can work their job, volunteer at the zoo, study Tibetan and train for a triathlon simultaneously. I can't even keep houseplants alive; that requires more bandwidth than I have to spare. 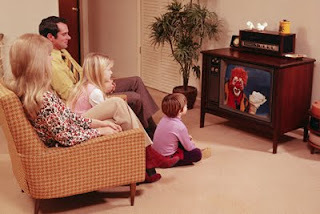 This poverty of resources forced me to give up watching television when I was nineteen years old. This development surprised me, because TV was a constant influence my parents' house. It was on every single day, like a light switch. I heard many more words from the TV than from my parents. My parents even gave me my own set for Christmas one year, and I felt grown up, having it in my room. 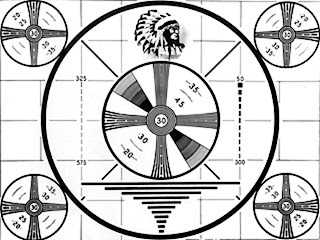 I watched almost every night until 1AM, when the signal went off and the screen went dead [forgotten antiquity!]. This environment being all I'd known, I didn't desire—or even imagine—life without TV. After high school, I stayed in my parents' house and worked a series of unpleasant jobs. One night I came home after a long day of class and night of work. As I scrounged around the kitchen, I heard voices from a dramatic show. A father character was beating his teenage daughter with a belt while his wife screamed, “No! Don’t! Beat me instead! Beat me!” The sound hit my tired nerves. I looked into the den, and it was empty. No one was watching this crap, but they left the set on anyway, just to fill the silence. The horror, the stupidity, the self-punishment of the program infuriated me. I vowed to stop watching television. Except for special news events. I have only seen TV sporadically from that day to this. Two things surprised me as I quit. The first was how easy it was to give up TV. I’d grown up in the blue light, and expected to go through withdrawal from the “addiction.” Instead, it was like waking from a bad dream, a relaxing relief, no effort at all. In a few weeks, when I did see TV it looked disturbing to me. I had no desire for it. Secondly, the improvement in my life shocked me. I felt lighter, hopeful, much happier. TV constantly begs for attention, and one powerful handle it grabs is our fear of violence and death. Evolution forces us to pay maximum attention to threats, so the more threatening the portrayal, the bigger the audience. Watching TV is like pasting electrodes to my skin and getting random shocks until I’m exhausted and my brain is scrambled. I didn’t understand this until much later. Maybe all that is beside the point. The worst thing about TV is: It's not about me. It's not about you, either, but that may not bother you. Now I have a six-year-old son, and I'm grateful that his schedule isn't determined by what's on the air. Of course, a great deal of video content is available on YouTube, etc. It's bite-sized TV. The clips can be started, stopped, forwarded through. Best of all, they don't subject young minds to commercials [usually]. This may be my favorite post of yours, so far. 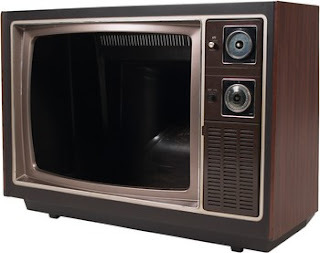 I grew up without TV, and the first few times I was exposed to it, I was horrified (even as a teenager) thinking, "Why is everyone screaming? Why are they so stupid? Who are those crazy people laughing in the background and what is so funny? "So I found it very interesting to hear from one of the indoctrinated.